We are now ready to accept your registration(s) for quilts in our April 2019 show. Please visit the Quilt Show page, for show & registration information, including location, categories, rules, etc. Register online, and then send in your registration fee & photos to complete the process. Be a part of the largest quilt show in Northwest Arkansas! Susan Cleveland will be featured teacher at our 2019 QUILT show, Tomorrow’s Heirlooms, scheduled April 5-6, at the ENCORE Event Center in Springdale. Susan is a renowned teacher and will be teaching classes on both Friday and Saturday. The Friday morning class will be 9 a.m.-noon. Accent curves with piping! This technique is wonderful for traditional curved patterns and great for contemporary designs. In class students will learn to make perfect piping and add that piping to the lively, curvy macaroni block. Piping adds pizzazz! Quilting and finishing will be discussed. A kit for purchase in class will contain pre-cut fabrics to make two 6″ blocks. Cost: $40 for QUILT members, and $45 for nonmembers. The cost includes a class kit. Class size is limited to 20. The Saturday class is 9a.m.-noon. Cost: $10 for everyone. This is a demonstration class only. No hands-on work. The building will open for those attending class at 8:30 a.m.
Susan will also present a one-hour lecture on Friday, time to be announced. Join one of the world’s most enthusiastic personalities for ooo’s, aaaah’s, and laughter to learn a plethora of tips to increase accuracy and add fresh,interesting details with piping, prairie points, heavy threads, and embellishments. See how to take show pieces to new levels and add charming surprises to simple pieces. Susan will share real live quilts with close ups through the projector so you’re sure to see oodles of detail. You may recognize many quilts as winners in AQS Paducah shows and International Quilt Festivals in Houston! Don’t miss out on this good time! *A ruler with at least 12 1/2 inches in one direction is required. Other sizes that may come in handy but are not absolutely needed include a 12 1/2 inch square ruler, a 6 1/2 inch x 12 1/2 inch ruler, and a 2 1/2 inch wide ruler. The short answer is that if you want to make the lap sized (48×60) quilt with blocks that finish 12 inches, you will need exactly one 40 piece jelly roll (2 1/2 inch strips.) If you’re prone to cutting mistakes, you might want to have a little extra coordinating fabric available. You may otherwise cut 2 1/2 strips x width of fabric from your stash. If you would rather use fat quarters, you will need a minimum of 12 fat quarters, but more variety would be better. The key in selecting fabrics is to be sure you have a variety of light, medium, and dark fabrics. This quilt works well as being very scrappy. For a crib sized quilt (36×45) only 24 2 1/2 inch strips are needed. Note: having your 2 1/2 inch strips precut before class is HIGHLY recommended unless you’re planning to cut from fat quarters. I will demonstrate a different cutting and assembly variation from fat quarters in class. If you would rather make the blocks in a 9 inch finished size, strips will be cut only 2 inches wide. The 9 inch blocks can easily be cut from fat quarters. For a crib size quilt (36×45), you will need at least 8 fat quarters, or for a lap size (54×72),at least 20 fat quarters. A six inch block can also be done in this pattern. If you’re interested in doing this, it’s cut from 1 1/2 inch strips. I can provide information on fabric needed the day of the class. Time: 9:00 a.m. – 3:00 p.m. Bring your lunch or plan to grab something at a nearby restaurant. Location: First Presbyterian Church in Rogers. 26th St & New Hope Road. Have a jelly roll you don’t know what to do with? 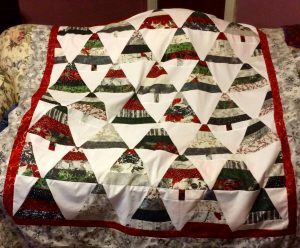 Our July Super Saturday Sew In will use a jelly roll to make a Christmas tree quilt. Called Jingle Pop Trees, this pattern was free last year from Hoffman Fabric. 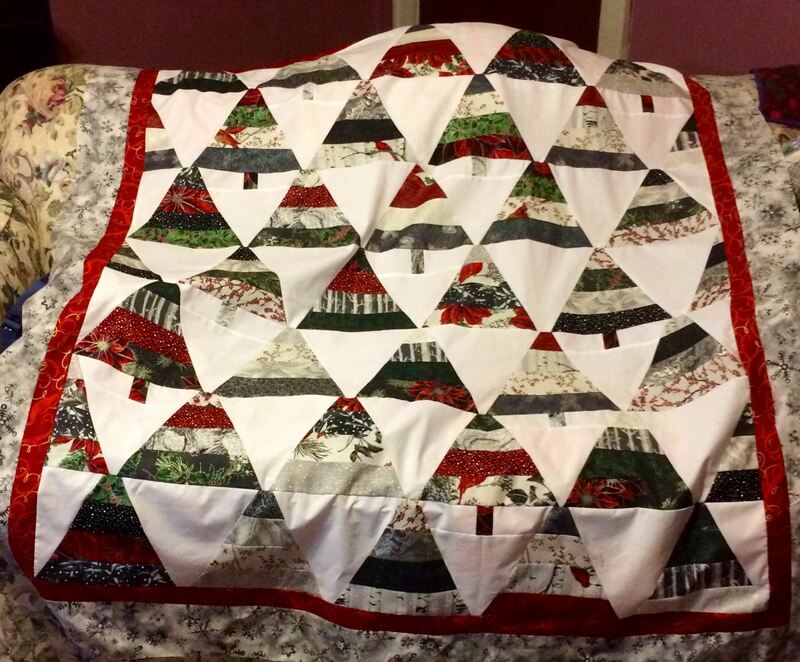 Your teacher is Leeanna Walker, and I made this quilt last year for the annual Altrusa Christmas auction. It sold for $300, so someone liked it. I’ll provide the pattern, you provide everything else. 1 jelly roll, or you can cut your own 2 ½ inch strips. You won’t use a full jelly roll 40) strips), but the more strips you have, the more fun you will have choosing which tree goes where. Cut your strips before class and you’ll be cooking with Crisco. Be brave! Choose your own color palette. Maybe you want fall trees or spring trees. Let your imagination run. Note: This pattern uses templates. However, after I had finished, I realized I could have cut them using a ruler with 60 degree marks. Duh! They’re equilateral triangles. So bring rulers with those marks if you want. See Amy Rollins or Leeanna Walker for additional information. Lunch: bring your own or there are many restaurants nearby. P.S. : This is my quilt! Due to a low number of sign-ups, the January workshop has been changed from the Wool Applique Workshop to this Quilts with Great Edges. This is an excellent workshop about bindings and edge treatments. You must sign up for this workshop with Lori Jones no later than January 8th. We need to fill this workshop so call or email Lori today! Click here for all the details. This year’s reveal party for the Hidden Stitch secret pal program will be on TUESDAY, DECEMBER 12 @ 6:00pm. The party will be at the home of Sheila Bayles @ 4007 Benjamin Lane, Springdale. On 71B, turn at the light on Stultz (Wagon Wheel Café). Go 4 blocks, turn left on Benjamin. 3rd house on the left. From I49, take Wagon Wheel Rd exit. Go east towards 71B. Go through the light at Silent Grove, take 2nd right, Robins. Follow Robins as it makes a curve to the left and becomes Stultz. Turn right on Benjamin, 3rd house on the left. Remember to bring your final gift with your reveal and also bring a thank you gift for the person who has been giving you gifts throughout the year.